Q: Who is Dr. Ayala? Dr. Ayala (Ayala Laufer-Cahana, M.D.) is the creator of these drinks. She is a pediatrician, a mom, a lifelong vegetarian and an artist. Q: How did she come up with the idea for this beverage company? As a mom, Dr. Ayala was constantly searching for healthy ways to nourish her family. She started making these drinks at home using herbs from her garden. Her family and friends enjoyed her herbal waters so much that Dr. Ayala considered sharing them on a larger scale. She decided to start a company offering this unique and healthy alternative to sugary mainstream beverages. Q: How do you pronounce her name? Q: How can I get in touch with Dr. Ayala? Q: Why do you use herbs? Herbs have been used by cultures throughout the world for thousands of years for food and medicinal purposes. Herbs have a high concentration of flavor and aroma molecules. Herbs are naturally virtually calorie free. There is nothing else on the market like this. Every other flavored water uses "fruit essence", no one has explored the rich variety of herbs. Q: Where do you get the herbs from? We get our herbs exclusively from organic growers grown locally and around the world. Q: What is the source of your water? Our water comes from an Artesian Well in the Shenandoah Valley, Virginia. Q: Why don't you use spring water? Spring water is a limited resource. There are a finite number of "drinkable" springs on the planet. Not all "springs" are pure, free of environmental contaminants, and available for commercial use. The term "spring water" does not guarantee cleaner, healthier water. Shipping this spring water across continents and oceans damages the environment, wastes fuel, and raises the price of manufacturing, which means the consumer pays more. Q: What are the natural flavors in Herbal Water? Are they safe? The natural flavors in Herbal Water are all organic compliant -- ensuring that they are plant derived, naturally extracted (without the use of chemical solvents) and are not chemically processed. You would recognize some of them very readily: we add, for instance, a bit of lemongrass extract to our ginger lemon peel. We do not use any unnatural ingredients under 'natural flavors' -- the USDA organic certification verifies that. We list those trace plant-derived ingredients as natural flavors in part to protect our formula. Q: Does Herbal Water contain gluten? Herbal Water is gluten-free and is safe for people with celiac disease. Q: Does Herbal Water contain allergens? Herbal Water is free of the eight major food allergens, including milk, eggs, peanuts, tree nuts (such as walnuts and almonds), soy, wheat, fish, and shellfish. Q: Do any of your products contain genetically modified components (GMOs)? No. GMOs are prohibited in organic products and our non-GMO status is verified by our organic certifier. Q: Is Herbal Water safe for pregnant women? Yes. Herbal Water uses only culinary herbs that are safe to use during pregnancy. Q: Is Herbal Water safe for babies and young children? Yes. Herbal Water uses only culinary herbs that are safe to use at any age, just like vegetables. Q: Is it safe to drink from a plastic bottle? Ayala's Herbal Water is packaged in polyethylene terephthalate (PET-1) bottles, which are perfectly safe. Bottle safety was the subject of e-mail hoaxes, but there's no basis to them. The concern raised in the media and science community regarding the reusable rigid plastic bottles is with Bisphenol A (BPA), which is an estrogen like compound that can act like estrogen in the body. The bottles with BPA are those marked with a "#7," such as some of the Nalgene bottles and baby bottles. After prolonged use, those plastics may wear out, and BPA may leach in small amounts. Whether that is a risk or not, OUR BOTTLES DO NOT CONTAIN BPA. Q: How is Herbal Water made? The herbs are extracted; the extracts are infused into purified water; the herbal water is bottled and sealed. Q: How do you purify your water? We use a multi-step purification process, which includes filtration, ultraviolet light, and reverse osmosis. We make sure to remove all dissolved impurities, so the water is a "blank canvas" to which we add the herbs. Q: Why do you use plastic bottles? Plastic weighs less than glass: it's easier and more efficient to transport and carry; it's also easier for a store owner to stock in their backroom. Plastic does not shatter -- it is a safer in some situations. Plastic is lightweight and ideally suited for people on the go. Our plastic is 100% recyclable. We see advantages to both plastic and glass, are considering packaging options constantly, and remain open to future changes. Q: Producing and using plastic has a huge impact on the environment. In what ways does your company offset this? Using sustainably harvested paper products for ALL our printed materials. We aim to manufacture in proximity to distribution and make the product in the most energy economic way. Our ingredients are organic, eliminating harmful chemicals from soil and the water that drains that soil. Q: Is Herbal Water organic? Yes, Ayala's Herbal Water is USDA Organic Certified. Q: What do you mean by "organic"? Q: Is being organic important? Herbal Water is organic-certified. This means there are no toxic pesticides and herbicides in the product, and no synthetic fertilizers are used. Therefore the product is better for you. Organic is also important to the environment. By buying and supporting organic, Ayala's Herbal Water and you as a consumer are contributing to agriculture that doesn't pollute farmland, endanger farm workers, and wreak havoc on the environment downstream. Organic food also usually tastes better and has better nutritional value. Q: Is Herbal Water vegan? All our flavors are vegan. Q: Is Herbal Water raw? No. We flash pasteurize our product at 180° and then immediately seal it, which prohibits bacterial growth. This process enables us to forgo the use of preservatives. Q: Is Herbal Water Kosher? Yes, we're certified Kosher by the Orthodox Union. Q: Does Herbal Water contain trace minerals? No. Our water is triple filtered and twice purified; virtually all dissolved mineral content is removed during the reverse osmosis process. Q: Does it have any calories, caffeine, or carbonation? Herbal Water has zero calories and contains no caffeine. We offer both still and carbonated beverages. Q: Don't the herbs lose their potency through the pasteurization process? Herbal Water goes through a "flash pasteurization," meaning it is warmed for seconds and then cooled. The beneficial molecules in the herbs are not heat sensitive the way some vitamins are and are not affected in any significant way. Q: Why don't you add vitamins and minerals to your drink? The best source of vitamins for most of us in the long term is properly prepared whole foods. For this reason, the importance of eating nutrient-dense meals, rich in vitamins and their co-factors, cannot be underestimated. Most vitamins produce optimum results in the presence of certain naturally occurring "cofactors," such as trace minerals, enzymes, and coenzymes, as well as other vitamins. It is futile to think we can provide all factors necessary to life in pill form or as a supplement in water. Vitamin supplements haven't really been shown to affect actual health outcomes in large studies the way food fruits and vegetables do. You can't get out of eating right with adding vitamins to water. Minerals are also abundant in food, and there's no reason to add them to drinks provided you eat food. Q: Does still Herbal Water come in a larger size or 4/6 pack? 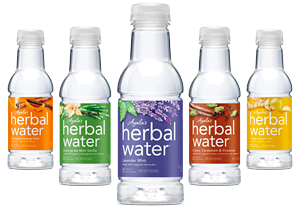 Herbal Water comes in one size: a 16 fluid ounce bottle that you can purchase in a twelve-pack case. Q: Is Herbal Water better than plain water? Herbal Water delivers hydration -- just like plain water -- but also great flavor and aroma and adds some herbal goodness. Q: Isn't it just regular tap water with some flavoring? No. Our product is cleaner and more pure than tap water. Our water goes through an extensive filtration and purification process. Unlike other brands that use synthetic or artificial flavoring, we infuse our water with real, organic herbs. Q: Is it better than other flavored waters? YES! Many flavored waters have calories, artificial sweeteners, and other artificial ingredients. Q: Do the herbs in this product really have any benefit? Replacing sugary drinks with Herbal Water will definitely reduce lots of empty calories from your diet. Herbal Water is also free of the artificial sweeteners, colors, and flavors that are of some health concern. While we would never assert any health claim, adding herbs and spices to your daily diet is part of a healthy plant based diet. While other recommendations change often, there is one consensus among nutrition experts: eating plenty of fruits, vegetables, herbs, and spices is the basis of a health-promoting diet. Q: Is Herbal Water expensive? Herbal Water is usually in the price range of other flavored waters and functional drinks. Herbal Water is made using the finest organic herbs, is manufactured in the US by workers paid a fair wage, and is a premium quality product that typically costs less than half of the price of an international coffee drink. Q: Is Ayala's Herbal Water available online? Yes. Please visit our online store. You can purchase a single flavor 12-pack or variety cases. We also offer free Ground Shipping to anywhere in the US.